Home » 20 Wondrous Facts about Space That Will Leave You Amazed! 11. A visible halo around the Sun or Moon means a storm is soon to come. The halo that is visible on occasion around the Sun or Moon is caused by ice crystals from high cirrus clouds. There is an old saying that says “ring around the moon means rain soon” and there is truth to this as high cirrus clouds often proceed a storm. 12. Most typical asteroids (such as Eros) contain precious metals worth more than $20trillion. 13. Earth can be seen as a pale blue dot in the picture below – 3.7 billion miles away. This photograph was taken by Voyager 1 in 1990 at a distance of 6 billion kilometers (3.7 billion miles) away. In the picture above, Earth is sized at a fraction of a pixel (0.12) against the vastness that is space. Even from within our own solar system, this picture provides some insight into how small we are in the cosmos. 15. 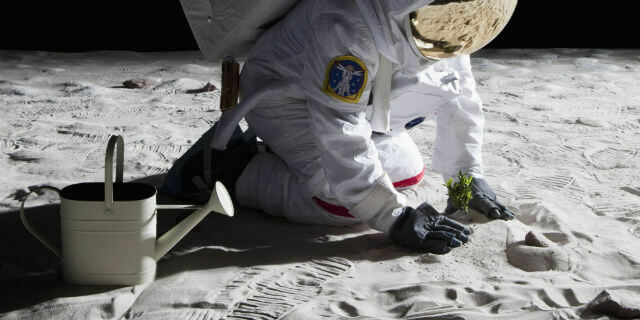 Did you know, this year NASA plans to grow plants on the Moon? 16. The dwarf planet “Ceres” between Mars and Jupiter has never been visited by a spacecraft or photographed in detail. What makes this puzzling is that Earth-bound telescopes have revealed two large bright shining spots on the surface within a crater. 17. If humans could survive on Titan, they could fly around by flapping wings attached to their arms. This is because the atmosphere is so thick and the gravity so low. 18. A Russian report of 33 cockroaches conceived in space has shown that they are tougher, stronger, faster and quicker than cockroaches on Earth. Cockroaches have always been known to be tough and perhaps the only organisms to be able to survive a nuclear war. However, it has been shown that cockroaches raised in space gain super abilities compared to their earthbound brethren. 19. The Moon is slowly leaving us behind at a rate of 3.78 centimeters (1.5 inches) per year. The Moon has always played an important role in the collective cultures of earth. Even before humans, it served to protect the World from dangerous asteroids, and today has a direct effect on the Earth’s axis and the ocean’s tides. Sadly, this close relationship will one day come to an end as the Moon is gradually moving away from us at a rate of 3.78 centimeters (1.5 inches) per year. 20. According to Stephen Hawking, humanity won’t survive without leaving the Earth. If what he says is true, we may have less than 200 years to conquer the final frontier. In an interview several years ago, Stephen Hawking expressed his concern that humanity is at risk of two different kinds of catastrophes. The first may be inflicted on ourselves, whether from climate change, nuclear or biological war; and second, by the cosmos, whether from an asteroid, supernova or gamma-ray burst, or perhaps less likely, by alien invasion. Sadly, whether we agree with him or not, it will take a long time for humanity to take the next step.